Adapted from Take-Out Tonight by Weight Watchers. Bring four quarts of water to a boil and follow package directions to cook the noodles. Rinse in cold water twice then set aside until the end of the recipe. Cut the chicken into bite sized strips. In a medium bowl mix sherry, 2 tablespoons of oyster sauce, 2 tablespoons of soy sauce, sesame oil, salt, pepper, sugar and corn starch. Whisk to combine and add all of the chicken and let sit while you prepare the remaining ingredients, or at least ten minutes. Just before heating the wok, pour the chicken and marinade into a strainer over a bowl. Stir the chicken around so it drains. Do not discard the liquid. Heat a wok over the highest heat you have and add a few teaspoons of the oil. Once smoking hot, add the ginger, garlic, onion, celery and green pepper and stir fry until starting to soften but still a little crunchy. Pour out into a large bowl. Add a few more teaspoons of oil and once hot, add the carrot and the bok choy bottoms. Stir fry a minute or two then add the green tops along with the Napa cabbage. Stir fry a few minutes longer just until the greens start to wilt. Add to the bowl with the other vegetables. Add a few more teaspoons of oil and once hot, add half the chicken in a single layer and cook for a minute or two on each side until just cooked through. Remove to the bowl and repeat for rest of chicken and again remove to the bowl. Heat the remaining oil and once hot add the cooked noodles along with the remaining tablespoons of oyster sauce and soy sauce, along with the drained marinade. Cook and toss with two pair of tongs until fully mixed and some of the liquid absorbed. Add all of the ingredients from the bowl along with the bean sprouts and chicken stock and again with two pair of tongs, toss and mix to combine. 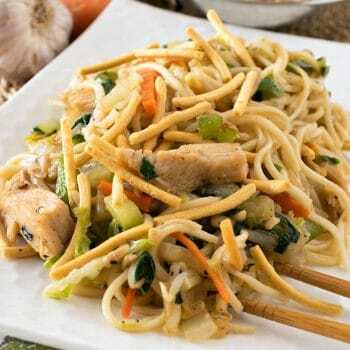 Remove from heat and pour into a serving bowl and top with the optional crunchy chow mein noodles.